This is the 2nd Journal entry for our Future of Work Journey. You can read how it all started here. After the first month of our Future of Work Guild’s journey one of the most important things we realized is, that shaping the Future of Work is a lot of Work. It’s not that we initially thought it would be easy, but looking into it there are so many topics to explore, so many interesting ideas and so much more to learn that it feels somewhat overwhelming. We all have the feeling that just looking at etventure there are options to find better ways of collaborating together. On top of that we also see that many other organizations put increasingly more focus on how the future of work will look like. There are many open questions, concerns and scepticism. And even if this does not make things easier for us, at least is shows that we are on the right track here. Obviously our process does not come without any challenges. Let’s look at a two of them as part of the current Journal Entry. etventure made it an important point to give each guild member a time budget of 2 hours per week to officially work on their topics. This is not only true for our “Future of Work” guild but also for all the other guilds that have formed within etventure such as Blockchain. Augmented Reality, Ideation and IoT. Two hours naturally is not a time budget to expect huge progress. But it sure gives each guild member some time to explore ideas, educate themselves or get in touch with experts on that specific topic. When it comes to the Future of Work guild, we have 15 members which equals a potential 30 hours per week. If we could effectively put this time budget to use, we could get quite a few tasks done. But in reality this comes with a couple of side challenges. 1) There is the important question on how to define the tasks and set priorities. We believe in the power of self organization, but in order to really create something tangible together that will help us to advance with etventure, we have to define common goals and find a way to coordinate our efforts. Otherwise people would just be working on the things they are interested in and it would merely be by chance if any of the outcomes can be used in general. 2) It is pretty much hard wired into every etventure employee that our client projects have the highest priority. After all this is where we make business and where our value creation happens. So when a client project is calling the guild comes second. Even if etventure as a company officially guaranteed two hours per week. It is very hard for project members to actually enforce those two hours. Imagine your project lead asking you to prepare a workshop for our clients and the team member argues that there is not enough time, since the Future of Work tasks are waiting. Although this would be completely appropriate, looking at the overall etventure strategy, it would at least feel awkward. In general we are quite satisfied with our current working mode. We have a bi-weekly, one-hour Sprint Planning where we talk about outcomes and results of the previous two weeks and plan the next steps. One hour ist very little time for 10+ guild members to talk about their individual achievements. So if possible the team members share their results beforehand through our internal slack channel. So during our meeting we can select certain aspect for discussion and try to focus on specific results that we can use as basis for our next steps. 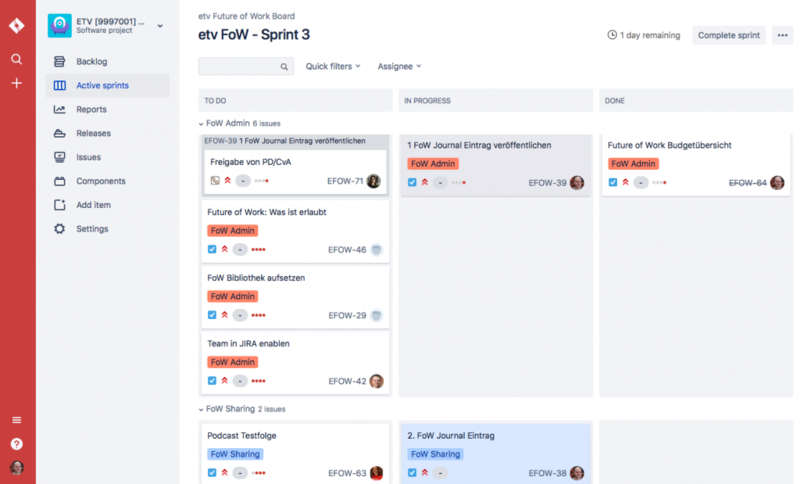 For this process using JIRA as agile Projectmanagement Tool plays out quite well. Everybody has a clear view of who is working on what and on the tasks that are coming up. There is one person going through the tickets before each planning session in order to make sure, that they are well specified and updated. In between two Sprint Plannings we have a half-hour check in every other week, for people to update on their progress. But quite honestly this has not been used much recently. Maybe the demand is not high enough. We will have to challenge if we keep that. Currently we are trying to account for the guild work by setting explicit blockers within our schedules to make room beforehand. After all the outcome of those guilds is not a nice-to-have but an absolute necessity from a strategic point of view. If we want to advance our knowledge at and have our team members to stay on top of current technologies and trends etventure has to commit and respect those kind of investments. One of the outcomes of our first 4 weeks was the first blog post on the topic of “Future of Work” which we released through the official etventure blog. We have shared the post through various social media channels inlcuding twitter and LinkedIn. Especially on LinkedIn this led to an interesting discussion. Within our post we asked the question, why people would be working in the future. People were quite critical about that. The main concern was that thinking about more purpose, flexible working hours, transparency and decentralized decisonmaking would not reflect on the reality of a more traditional worksforce. For us the discussion was extremely fruitful since it challenged us to reflect what our own expectations are in that ara. Are we looking to find a general model on how the future of work will look like in general with a minimum common denominator for all industries and all demographics. Or do we focus entirely on our own organization first. After all we have to meet somewhere in the middle. Obviously it can not be our goal to find the final solution fitting for each and everyone. But on the other hand just looking at our own business would not be very helpful in the overall context. Therefore we plan to actually get in touch with people from as many different backgrounds as possible. May it be the student looking for a first job, the 35 year old family father working in a powerplant. The teacher, the hairdresser or a facility manager at the age of 55. Our assumption is that all of them have different challenges, fears and wishes, but we hope to find some underlying common theme that might help us to deduct the important issues that can be transfered to a variety of differnt workspaces. And after all we understand that change is not something easy that can be expected to happen within a couple of months. But only if we talk about desired scenario, we can think about how to get there. And given that backgroudn we still believe in the initial question of “Why people will work in the future”? Because answers to that question will provide a guideline on finding out what and how we will work in the future. And this after all is something we want to test, implement and talk about. We care about Work. Introducing the Future of Work Guild. At etventure, employees are working in self-organized guilds, to transfer individual theoretical detail knowledge into collective action. On one hand, the guilds prepare and distribute their internal and external detailed knowledge and on the other hand, their diverse composition of the team enables them to put their knowledge into a new context.. This journal invites you to accompany the Future of Work (FOW) Guild’s journey. Also, see our work in progress definitions on future of work. What is Future Of Work (to us)? 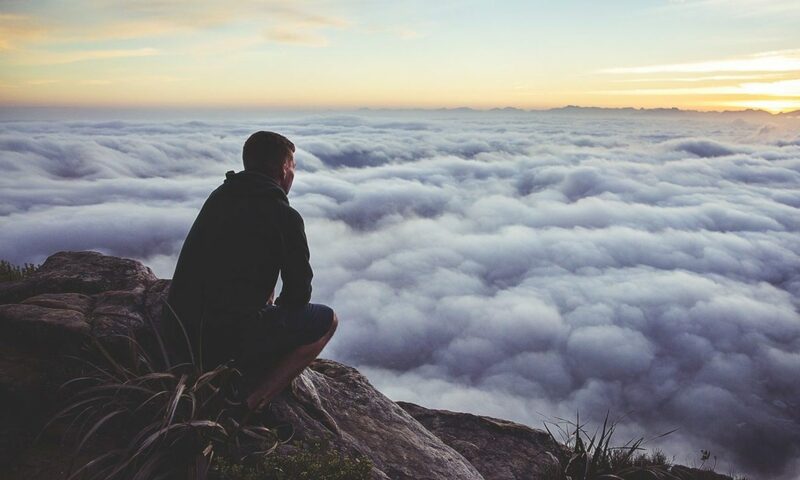 “As entrepreneurs, we strive to provide value – not just for business – but society as well.” What does our etventure vision have in common with other visions? Yes. It sounds nice but after all it is still a very broad statement. But when we break it down into pieces, it comes down to why, what and how we want to do things in our every-day (working) lives. Future of Work Hypotheses (MVP) – develop, test, document and publish different hypotheses regarding the Future of Work within etventure. We will use a Design Thinking approach to come up and validate new ideas. Our goal is to test at least 2 hypotheses per quarter and create a detailed report at the end of the year including research, best practices and case studies from our own tests. Future of Work Network – build a network around the Future of Work. That means we want to get in touch with experts and organizations that are relevant for that topic. Also we want to establish ourselves as experts on the Future of Work. Our goal is to publish 2 blog posts, have one speaker appearance and/or conduct 1 meetup on the Future of Work per quarter. Future of Work Products – last but not least etventure is a business. So in order to make sure that the outcomes of our guild have a positive business impact as well, we want to use our findings and experience to create a Future of Work Portfolio, that we can offer to our clients in form of input sessions, workshops or learning journeys. Our goal is to create at least 2 products per quarter in various formats. We hope you enjoy this journey with us as much as we do! Feel free to contact us and collaborate!